on Saturday 2 August 2014. The Groove Gardens﻿, Gianpula, Rabat. who will be with us the whole night. Alt. Rock & Gothic Rock. 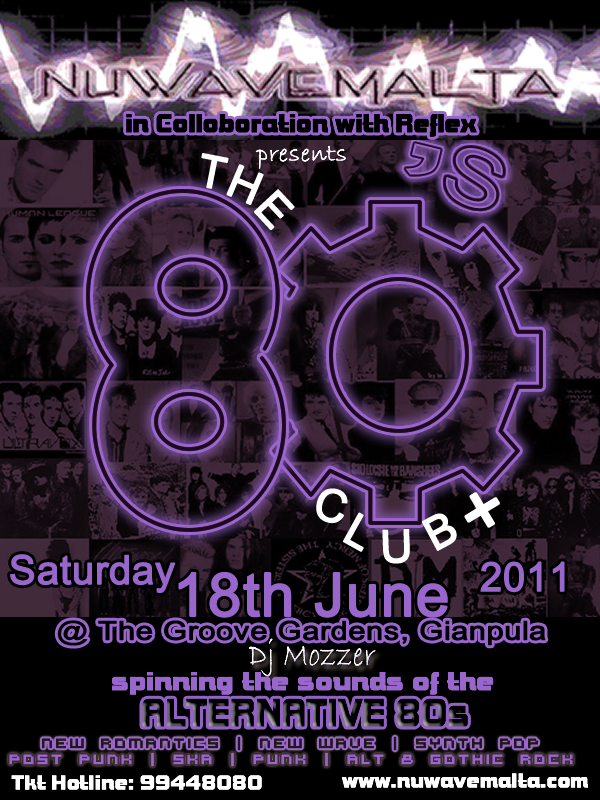 for Free Entry to the Groove Gardens. DEPECHE MODE VIDEOS ALL NIGHT LONG!! 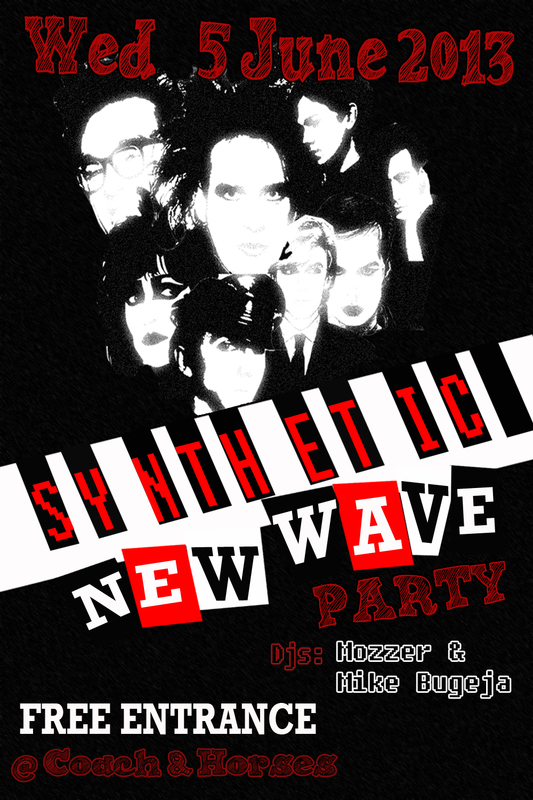 with New Romantics/New Wave/Synthpop/ Post Punk from all eras!!! Surrounded with Depeche Mode videos all night long. 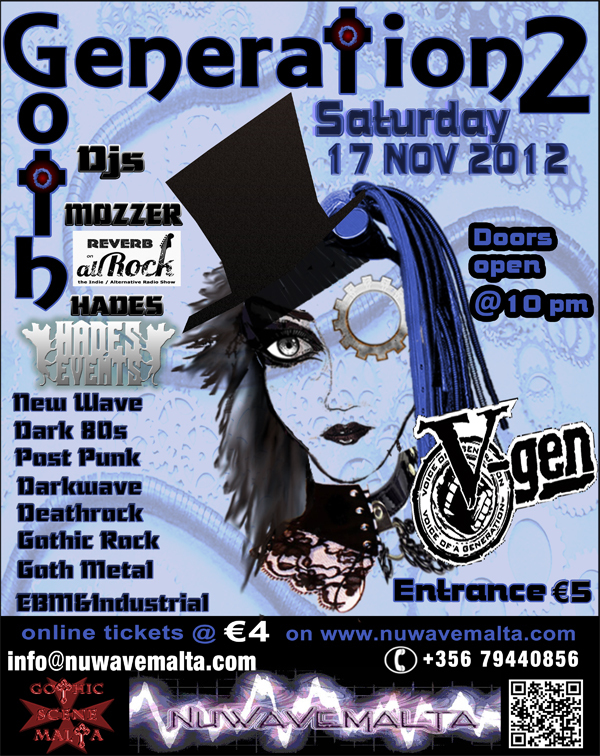 Sat 17th November 2012 @ V-GEN , Paceville. Event Starts at 10:00 p.m. Sat 14th September 2012 @ V-GEN , Paceville. 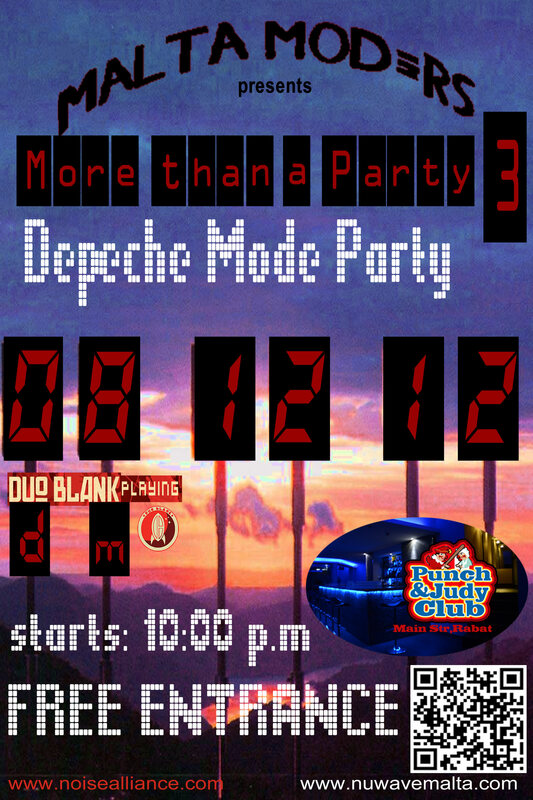 Event Starts at 9:30 p.m.
DUO BLANK playing Depeche Mode!! 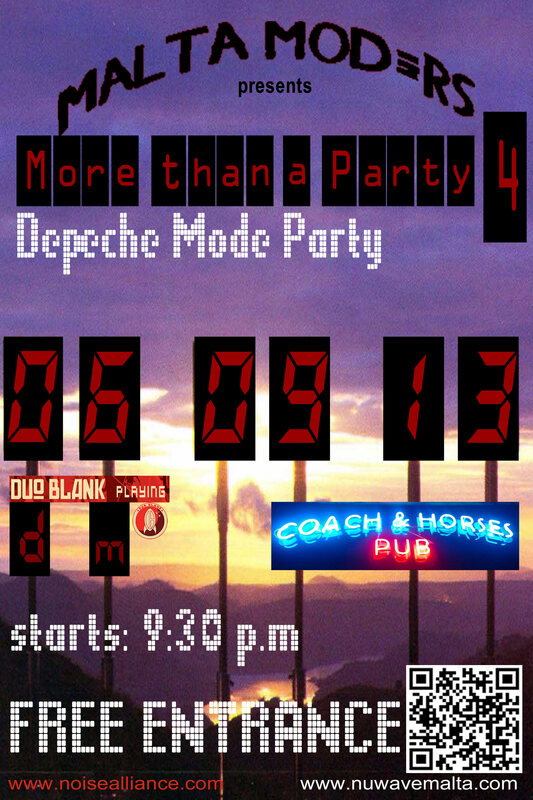 Depeche Mode videos all night long on the X-tra Large Screen. 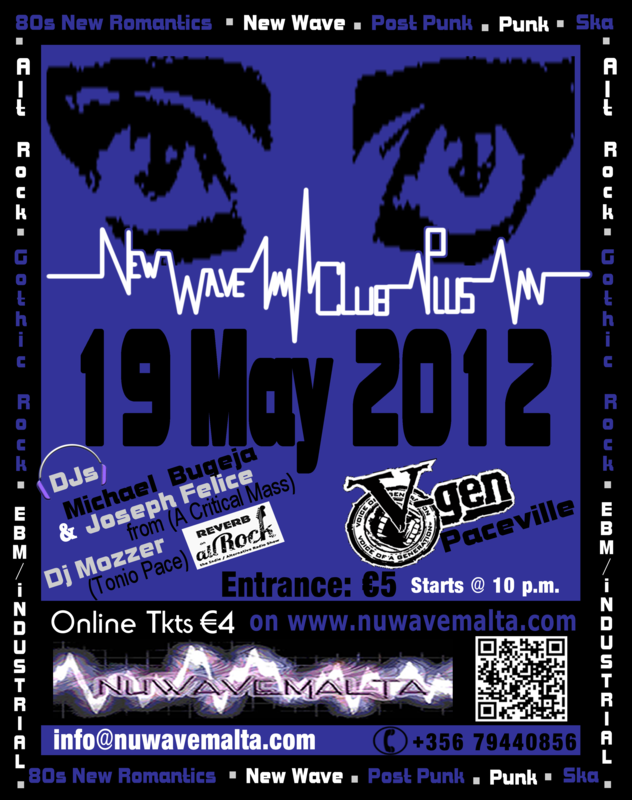 Sat 19th May 2012 @ V-GEN , Paceville. 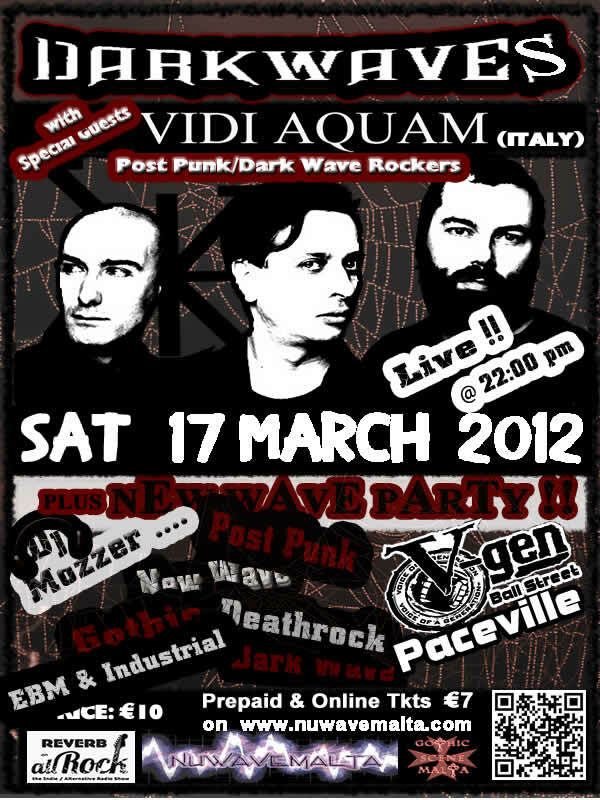 An Event by NUWAVEMALTAin colloboration with V-GEN ROCK CLUB!! for our 1st event of 2012. 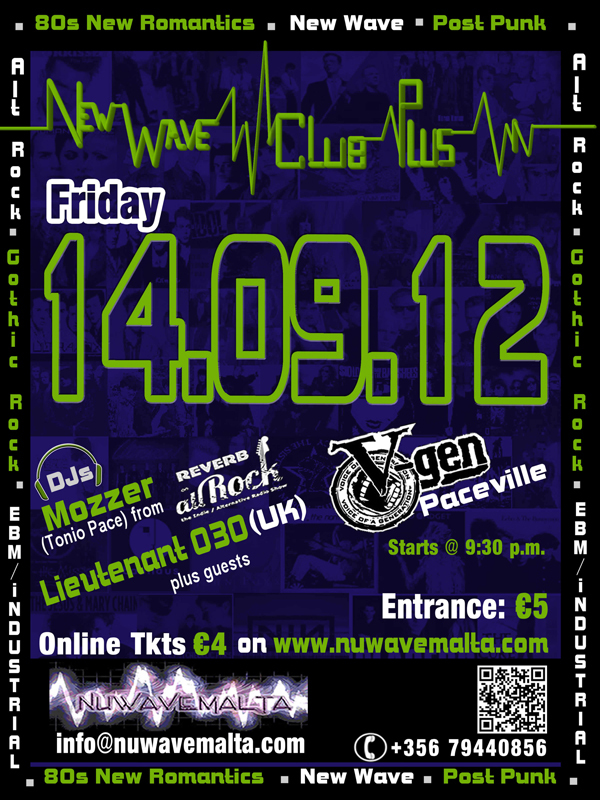 Nuwavemalta presents the New Wave Club Plus. Saturday 21st January 2012 @ V-GEN , Paceville. ENTRANCE: 5 EUROS at the door. 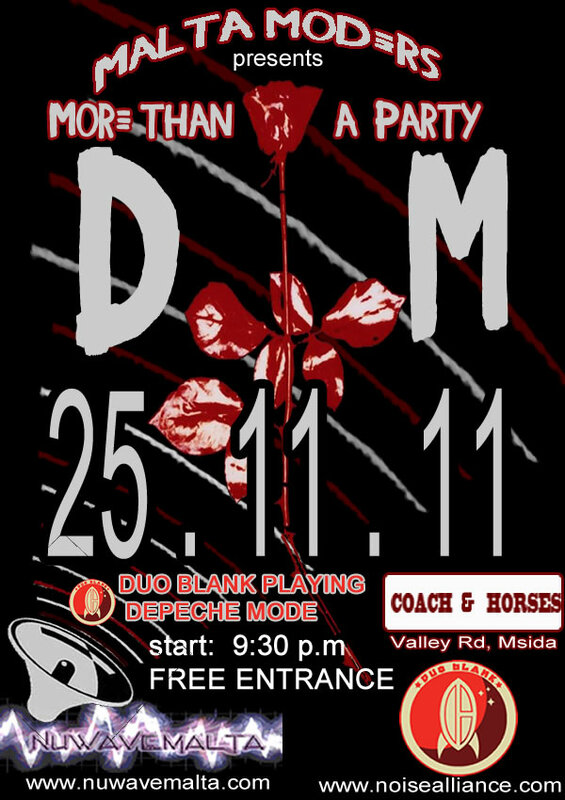 for the last event of 2011. 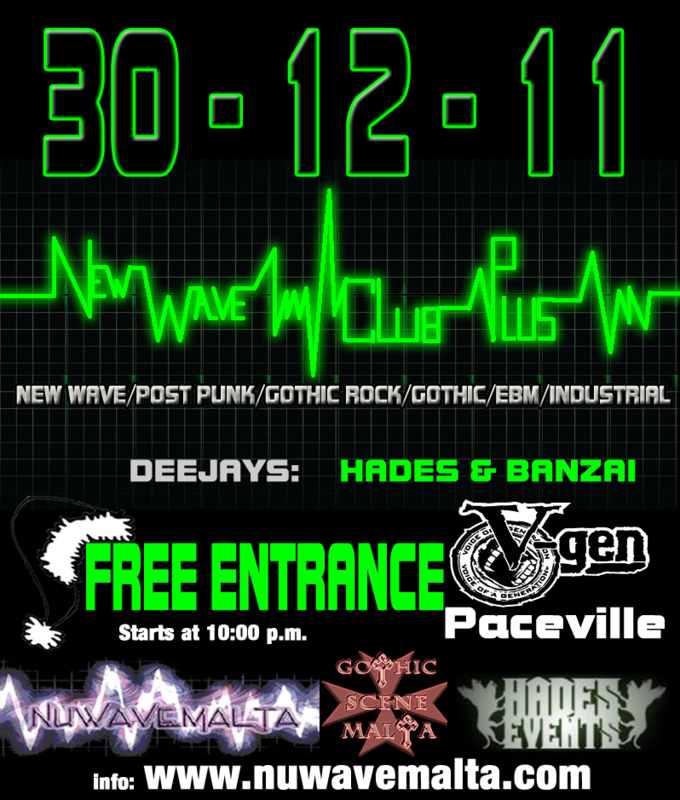 Friday 30 December 2011 @ V-GEN , Paceville. Click to view Large Flyer!! in Colloboration with Duo Blank. 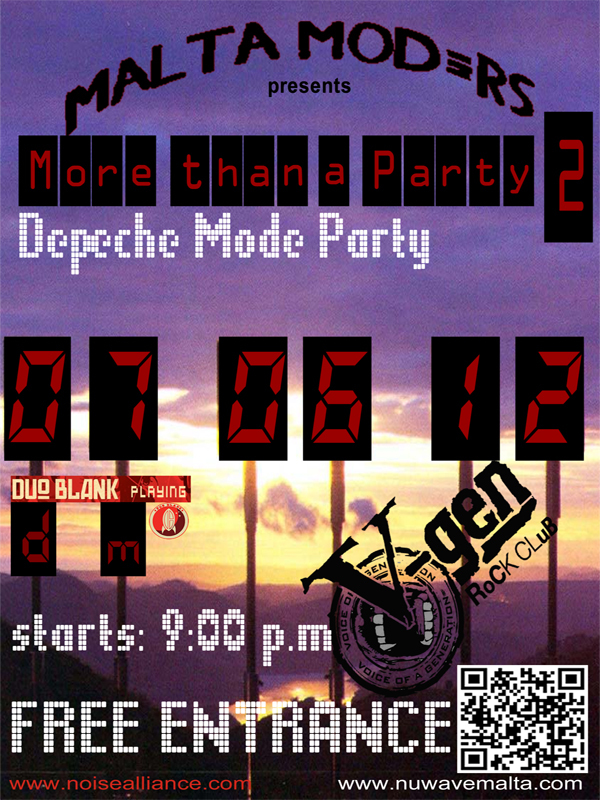 Depeche Mode all night long. - DM videos all night long. WILL BE no longer organised by NUWAVEMALTA. is still being organised BY REFLEX PROMOTIONS!! 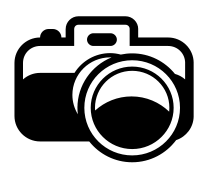 - a night of memorabilia of the Alternative 80s. /Ska/Punk/Alternative Rock and Gothic Rock. Prebooked Tkts 6.50 Euros plus offers. to get guestlisted for the night. for the first time in Malta!!! 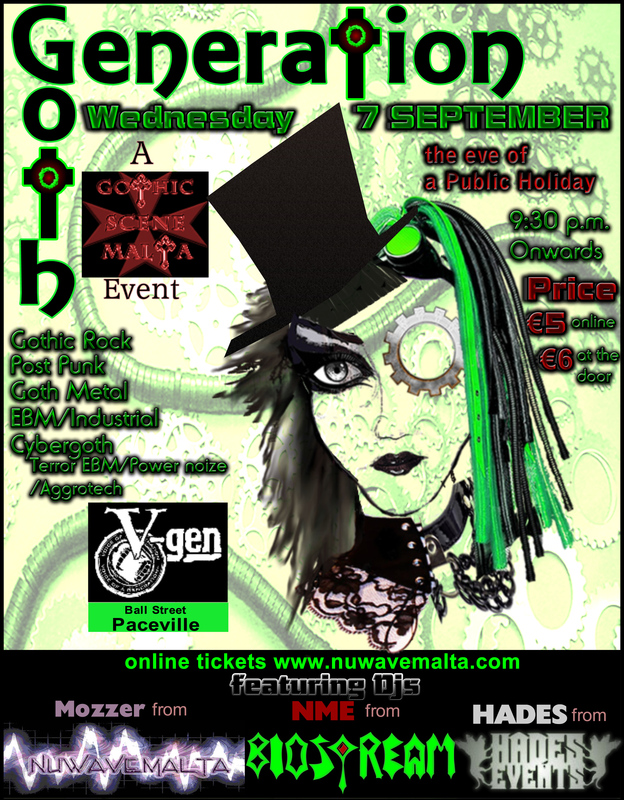 the greatest Goth night ever!! 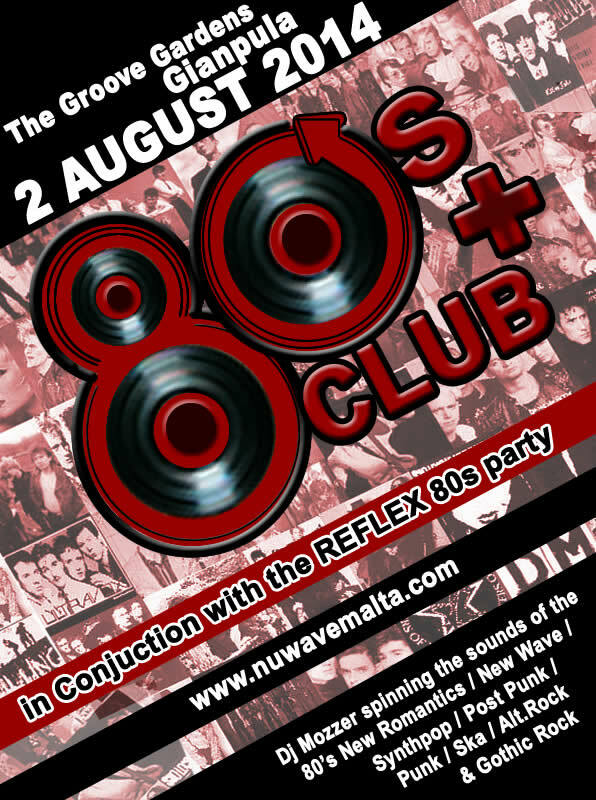 Nuwavemalta holds again the 80's Club + @ The Groove Gardens, Gianpula - a night of memorabilia of the Alternative 80s. 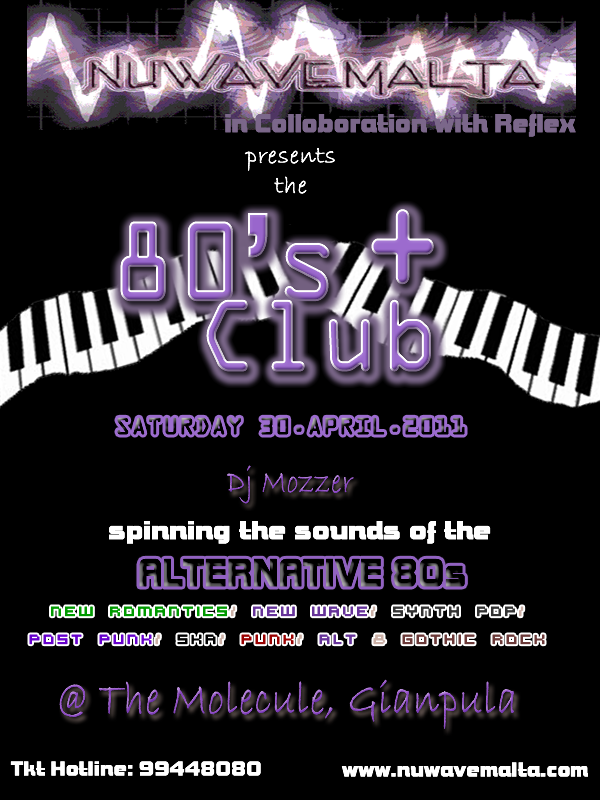 Dj Mozzer will be spinning the sounds of the 80's New Romantics/New Wave/Post Punk/Ska/Punk/Alternative Rock and Gothic Rock. 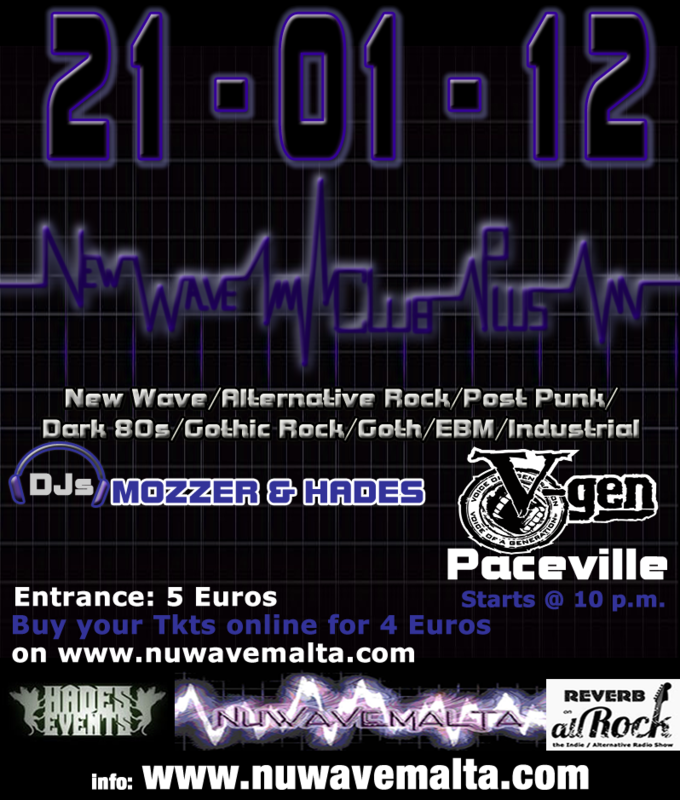 Fans of Nuwavemalta will get priviledges!! 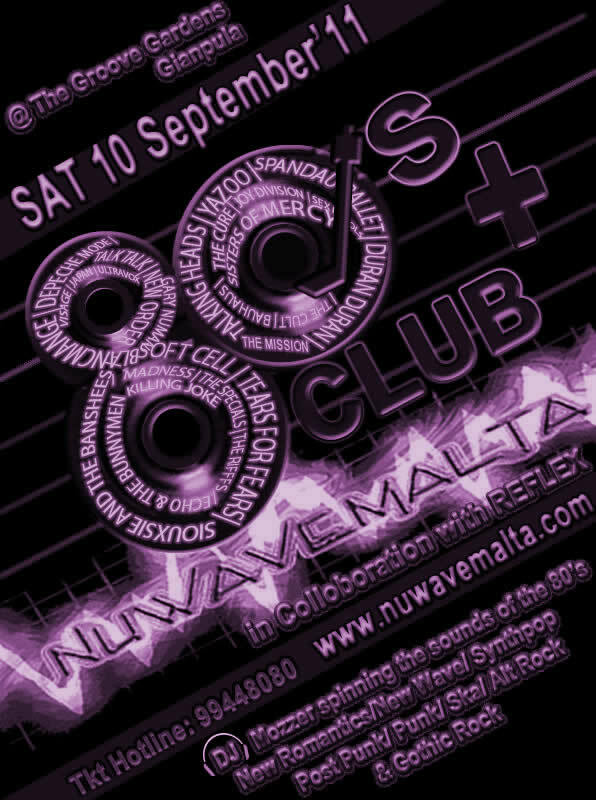 Nuwavemalta holds again the 80's Club + @ The Molecule Club, Gianpula - a night of memorabilia of the Alternative 80s. 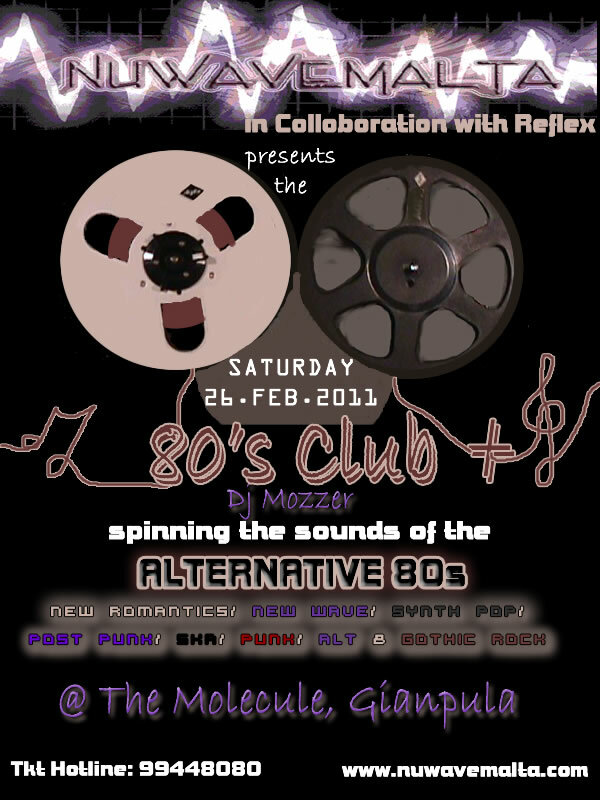 Dj Mozzer will be spinning the sounds of the 80's New Romantics/New Wave/Post Punk/Ska/Punk/Alternative Rock and Gothic Rock. __________________ Back to the Phuture - Tomorrow is Today!! 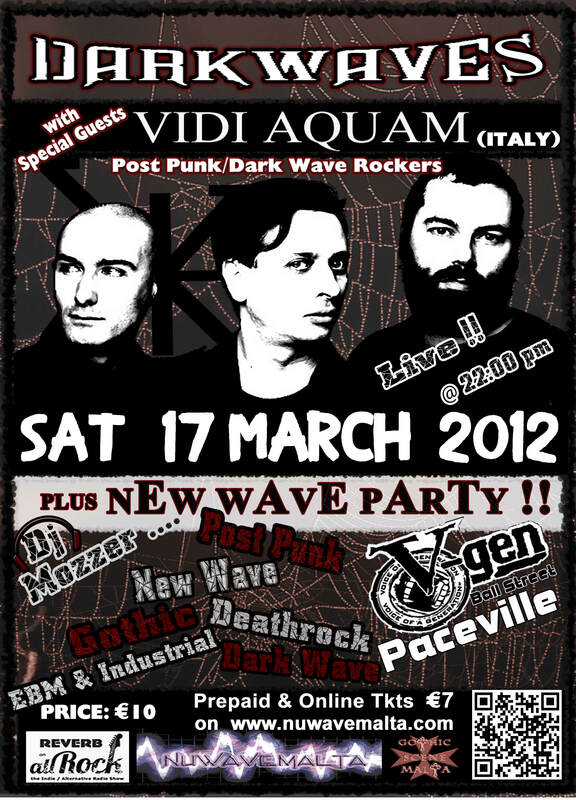 Nuwavemalta will be joining on the 2nd April 2010 at The Troxy for this fab gig of New Wave!! 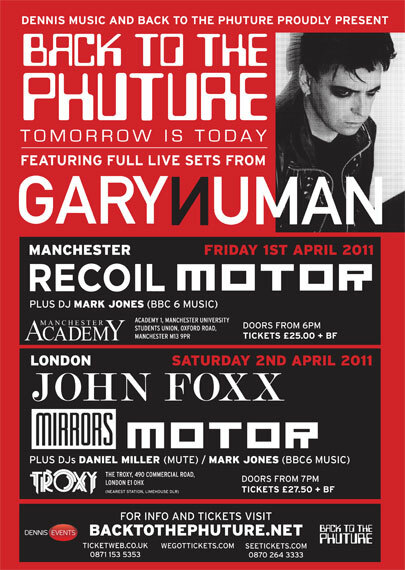 Gary Numan, John Foxx, Obsessive Electronic DJ - Mark Jones, Motor (live set), The Mirrors (Live set), DJ Set by Mute Guru Daniel Miller all on the same Plate!! We'll get you updated with the outcome!! Weeping Silence is organising the event in collaboration with this fantastic venue. 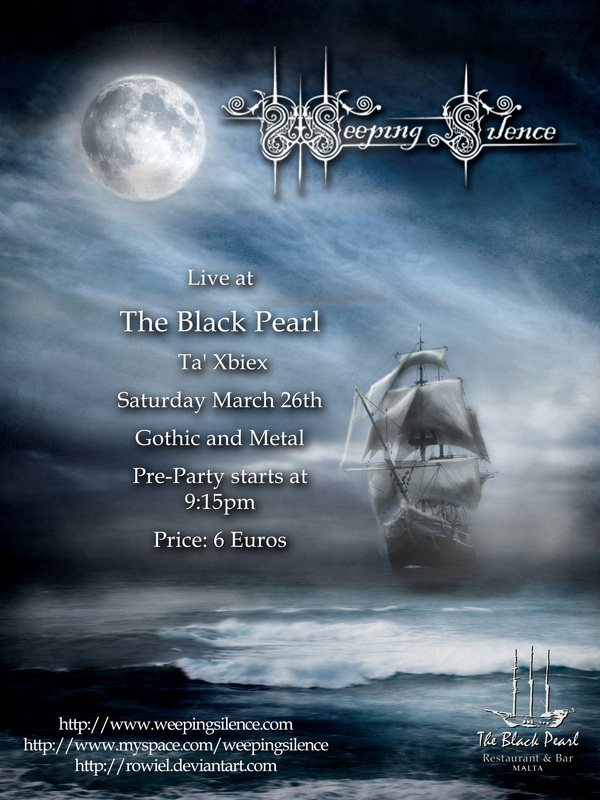 A pre-party will start at 9.30pm with tons of gothic and metal music. The on-stage gig will start at circa. 11pm. The double CD compilation 'Des filles et des Riffs' will be on sale at a special price, as well as the 2nd album 'End of an Era'. After more than 8 months absent from the Maltese live scene, this event is not to be missed! Nuwavemalta will support this event so don't forget to be there!!! @ The BLACK PEARL, Ta' Xbiex.